"He's got the brains in the family, HE's got the brains." Schreiber played the villain, Captain Bernard Manzini, on "My Mother The Car". Perhaps you remember him from that... Wait, nobody remembers much of anything from that (except me, I loved the show)! I am wondering when I see Mr. Schrieber's picture - did he perform in the Doritos chips tv commercials? 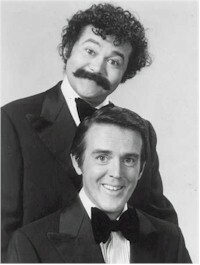 Also on You Tube..Messers:Burns and Schreiber hosted ABC TV's 1973 Saturday Mornings kids tv show preview special. These guys got hot after a NYC overnight talker named Steve Post on FM radio station WBAI kept playing their hysterical taxi sketch every night for months. Word of mouth led to bookings, and they took off. Jack Burns was also half of a short-lived comedy duo with George Carlin (~1960-62). Jack Burns played the dedicated but inept deputy sheriff Warren Ferguson during the first half of the 1965-1966 season of The Andy Griffith Show, as Barney Fife's replacement after Don Knotts left the cast. His character was awful and was dropped without explanation after eleven appearances. The series did not have a deputy after Burns left the cast. Also check out their "Faith Healer" routine. I think it's on YouTube also.